We know you can’t compromise on compliance. That’s why DocuSign supports compliance with industry regulations like 21 CFR Part 11, and regional requirements like eIDAS (Electronic Identification and trust services) and EMA (European Medicines Agency) in the EU. 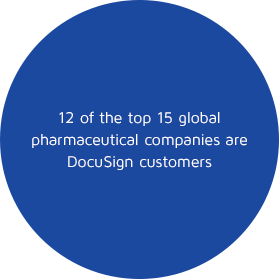 DocuSign is trusted by 12 of the world's top 14 of the top 15 global pharmaceutical companies. We help you in the most important part of your work—developing and launching products that improve patients’ lives.